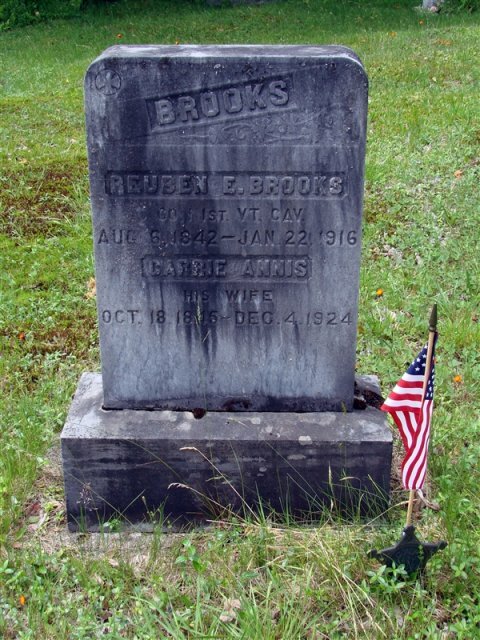 "Reuben E. Brooks enrolled for duty with the First Regiment of the Vermont Cavalry at age 20. He enrolled in his town of residence, Irasburg, on September 27, 1861, promising three years of service. The value of the horse he brought with him was $112.00, and the horse's equipment was worth an additional $31.53. Reuben was mustered in on November 19, 1861, in Burlington. He began as a private with Captain Sawyer's Company, which subsequently became Company I. His pay records indicate he was out "sick" from December 1 to 31, 1861. On August 1, 1862, he was selected as the Company I Teamster, drawing the team. On July 10, 1863, he was chosen as the Teamster for the entire First Regiment. He also served as the Company I Wagoner. On October 23, 1864, his term of service expired, and he returned to Vermont to be mustered out, being owed $19.79 on his clothing account and $100.00 in bounty. Reuben was the only son of four children born to Amos Brooks, born (1810-c. 1860), and Almeda Leet (1807-1887) all born probably in Shipton, Quebec, Canada." Source: Family and service records held by the family. Contributed by Vicki Duckless Flanders, Reuben's 2nd-great-grandniece.